It's time to hand Turtle Bay over to a woman. Type “50 shades of Merkel” in Google. (Don’t worry, it’s safe for work.) The first result you’ll turn up is a chart featuring 90 different pictures of German Chancellor Angela Merkel. In each picture, she’s wearing the same style of suit — albeit in a different color, from pale mint, to passing-sky blue, to mauve, all the way to fire-engine red and ending with a surprising range of blacks and grays. The image, originally published in the German tabloid Bild, satirizes her decision, in a world obsessed with women’s appearances, to stick with one particular fashion. Would anyone have considered giving Barack Obama or David Cameron the 50-shades treatment? No. The fact is women in public life are lightning rods for criticism, scrutinized in ways that men never are. I am chairman of the Institute of Directors, Britain’s oldest organization for business leaders. One evening this June, we hosted a lecture by Julia Gillard, Australia’s first female prime minister, who spoke frankly about the gender-based hostility she endured during her career. In one stunning example, she recalled how Bill Heffernan, a Liberal senator, once branded her as “deliberately barren” for not having children. 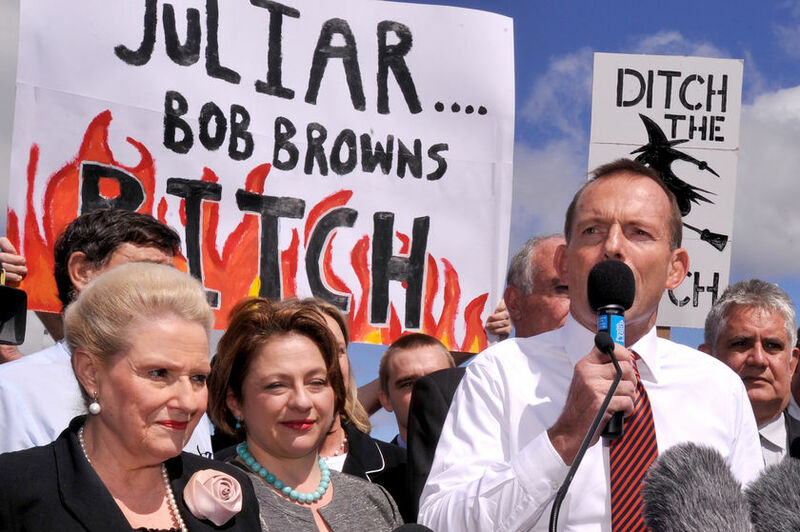 Tony Abbott, Gillard’s opposite number while she was prime minister, took to standing beside protestors brandishing posters with the words “Ditch the Witch” printed on them and routinely resorted to what Gillard described as “gendered insults” during heated debates. In an argument over proposals for a carbon tax, Abbott told the prime minister to make “an honest woman of herself.” Such hostility culminated in a famous address to parliament, in which Gillard told the opposition leader that if he wanted “to know what misogyny looks like in modern Australia,” he need only look in the mirror. Perhaps the most revealing moment of the evening occurred during the question and answer session. Natalie Bennett, leader of the U.K. Green Party, asked Gillard about how to make yourself heard over bickering male politicians. Gillard’s depressing response: Go loud, and you will be called strident and shrill — or, in her exact words, “hard-boiled and ruthless.” Go quiet, and you’ll be dismissed as meek and unconvincing. But perhaps all this extra scrutiny that women face could be turned into an advantage. Next year, the United Nations has an opportunity to appoint its first female secretary-general. If that happens, the U.N. will have taken 71 years, and nine attempts, to elect a woman to one of the most visible roles in international politics. Critics would immediately question whether the successful woman — and there are numerous eligible candidates — owed her position to tokenism, and make the inevitable suggestion that better men had been passed over. There will be a level of pressure both on the U.N. and on the woman herself that simply wouldn’t exist for a man. But at a time when the U.N. is fighting for relevance and is often criticized for inaction, the harsh glare of the spotlight is what it needs. Firsts always make people sit up and take notice. I was the first female director of a British merchant bank, the first female executive director at News International, and am now the first female chairman of the Institute of Directors. I was also only the second woman to have been appointed a commissioner on the U.S. Securities and Exchange Commission (SEC) — my big break. There are now 11 women who have sat on the SEC; George W. Bush and Barack Obama appointed seven of them. The first female chair in the SEC’s 81-year history, Mary L. Schapiro (appointed in 2009), was quickly followed by the second, Elisse B. Walter in 2012, and the third, Mary Jo White, a year later. It is now generally accepted that there are as many excellent female regulators as male ones. Organizations with significant gender imbalances have few excuses. Studies, including one by McKinsey & Co., show that companies with more women in senior positions tend to be more profitable, while I have found that a greater range of viewpoints helps prevent business from growing staid and rigid. Likewise, as the International Monetary Fund and Organization for Economic Cooperation and Development have shown, higher levels of female participation in the wider workforce and government correlate with greater advances in human development. In politics, as in business, the skills and perspectives of women improve decision-making, and deliver the products and policies society needs. The U.N. has arguably done more than any other body to advance the cause of women and girls across the world. It will, however, miss a huge opportunity to go one step further if it fails to appoint a woman to the top role. From my own experience, I know the power that diversity of thought, background, and experience brings to an organization. The U.N. has already recognized this and recruited hundreds of high-profile “goodwill ambassadors” from the world of arts, culture, and sports to champion campaigns and initiatives around the world. Actresses Emma Watson and Nicole Kidman are both ambassadors for U.N. Women, and Angelina Jolie has been a high-profile special envoy for the U.N. refugee agency. As valuable as goodwill ambassadors are, however, the U.N. needs women in positions of power and prestige before the cameras. We must go beyond taking a few pictures of actors and actresses and ushering them out of the room so the men can get down to business. The U.N. seems to have accepted that its days as the world’s police force are over. Its priorities have shifted from political territorial disputes to long-term challenges like human rights, climate change, sustainable development, and dealing with the civilian implications of conflict like mass displacement and refugee crises. The Security Council can signal its support for this new, more focused U.N. by nominating a woman to steer the ship. Two candidates stand out: Helen Clark and Irina Bokova. Clark served three successive terms as prime minister of New Zealand and has been administrator of the U.N. Development Program for the past six years. These credentials give her more than enough experience to match any previous secretary-general. Bokova, the former foreign minister of Bulgaria and twice-elected director-general of UNESCO, has ample experience in managing U.N. projects and understands how the organization must operate in the future. The short list doesn’t end there, though. It also includes Michelle Bachelet, the two-term president of Chile, Rebeca Grynspan, the former vice president of Costa Rica, and María Ángela Holguín, the foreign minister of Colombia. All are experienced politicians who would bring different styles of leadership. Women are often said to operate with a more consensual leadership style than men. But we should avoid stereotypes. In my experiences serving as chair of a company board, I made it a rule to engage with the directors on sensitive matters prior to formal meetings. This prevented other directors from feeling ambushed or from stalling by asking for further information. This may seem consensual, but, in my mind, it is a much better way to make appropriate and timely decisions. Whatever the gender of the next secretary-general, he or she will need to be practiced in winning agreement from a wide range of conflicting interests. Just as with a board meeting, by the time leaders convene for a General Assembly, it’s probably too late to find common ground. Convention dictates that the secretary-general will not come from one of the permanent members of the Security Council and that it will submit only one candidate for approval or rejection on the floor of the General Assembly. It is customary for the secretary-general position to rotate between each regional group of the U.N.; 2017, for instance, is supposed to be Eastern Europe’s turn, which works in Bokova’s favor. Anybody who wants the job must begin her campaign now. Women are often reticent to put themselves forward, but one thing is certain: Men will be maneuvering for the position already. When President Jimmy Carter nominated me to join the SEC in 1980, my chances did not look good. Ronald Reagan was set to storm the White House, and the Republicans on the Senate Banking Committee had made it clear they would not be approving any more Carter nominees. So I did the only thing I could. I asked to meet every Republican on the committee and tried to convince them that, despite being the youngest ever nominee and a Democrat, I was up to the job. Luckily, my efforts paid off. The committee confirmed my appointment, beginning one of the most fascinating periods of my career. I very much hope that the U.N. recognizes the importance of proving its commitment to women’s empowerment by finally giving its top job to a woman. I hope the permanent members of the Security Council will see that attracting greater scrutiny will improve the organization’s legitimacy. Hoping for change, however, is different from making it happen. The world has waited 71 years already. Let’s not give the U.N. the chance to make us wait longer. Barbara Judge was the first woman member of the Board of Overseers of the Wharton School and is a Trustee of the Lauder Institute, and a member of the Europe, Middle East and Africa Board.